This section of our site is written entirely by the fans. You read our reviews and you know what we have to say about the artists and their albums but we would like to know what YOU think. If you have been to a concert, we would love to have you share your experience with us. Write your own concert review, it doesn't have to be long, in fact, "it was awesome" will do just fine, or tell us your story, "he/she inspired me to follow my dreams because..." or write an album review is good too, we only ask that you try to keep the reviews under 300 words. See submission form at bottom of page and please let us know where you're from. ​I had the chance to meet Keith Urban, after he had his album release party at the Iheart theater in NYC!! It was the most exciting day ever. My sister was trying to take the pic and couldn't get my phone to work and Keith took it from her and we did a selfie!! I was on a cloud for weeks! It was posted in Country Weekly Magazine 2 weeks later and I would love for you to post it too! August 31st when James Wesley came to my little town of Broadalbin, NY to do a benefit for the Korona Family Dairy Farm at Finnigan's Restaurant-Pub. I suggested him to Finnigan's because of his support of farmers, and so happy it worked out he could do this for the family. What an awesome man he is. NAC: Thanks Sue, Although we have heard great things about James, we yet to catch up with him. I got to meet Jake again thanks to a friend. I live in Milwaukee,WI. Jake loves his fans . The first thing he said to me was , can I have a hug. He signed a picture of the last meet with him. He is very sweet & appreciative of his fans. Nac: That's Awesome Linda!! Just do us a favor next time, hug him twice, once for you and once for us. My favorite country star is Chris Young. I had the opportunity to meet him on my birthday, 6/6/78. My friend saw him first and told him it was my birthday, so when it was my turn I was greeted with a huge smile, a hug and a the words "Happy Birthday honey!" Needless to say it was my best birthday ever! The show was amazing, he really commands the stage. He had the entire audience in the palm of his hand. I can't wait to see him again! Nac: Jennifer, Happy belated Birthday! We couldn't agree with you more, Chris's smile is genuine. Our Sr.Editor met him years ago and knew he was going to be a star when she said "Write this down: C-H-R-I-S Y-O-U-N-G. The name is easy to remember but the voice is impossible to forget." Well, still to this day, that's our story and we are proud to be stickin' to it. Rita S, Kristi M. and Jake S. with the very talented Okie, Wade Hayes. The photos were taken at the Cherokee Casino in West Siloam Springs, OK on 5/4/13. He put on a terrific show, made it a point to meet everyone. We enjoyed ourselves and Wade. Great guy, wonderful entertainer. We love him! NAC: Rita, we know how you feel. All of us here at NAC are Nuts About Wade. We met with him a few years ago ourselves, and we were beyond impressed with his talent and personality. He is most definitely a blessing to the country music world. CMA Fest 2013 locash cowboys at the bud light stage best show i had ever seen!!!! NAC: Eddie thanks for sharing your LoCash Cowboys experience with us. It's no secret our Owner/Editor is quite fond of these guys. We believe big things are the horizon for them. 2013 is the year for the Locash Cowboys! I was lucky enough to meet Jake again when he was here in Milwaukee,Wisconsin . What a nice guy. He takes the time to talk to his fans. I had a picture I took of him at a previous concert & he personalized it for me. I can't wait to see him in concert next Year again. Nac: Thanks Linda for sharing this great photo with us. He is a nice guy. We look forward to hearing more from him in the years to come. 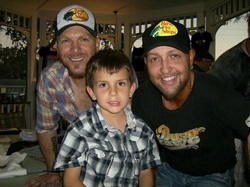 My son is a huge, huge fan of the LoCash Cowboys. He goes around singing their songs word for word. He even asked Santa to bring him a microphone and guitar, so he could be like Chris and Preston. The LoCash Cowboys are nothing less than amazing! They are hard working and very devoted to their fans no matter the age. NAC: We couldn't agree more. Hope Nathan gets that microphone from Santa. Our Owner/Editor says "They are the ones to watch in 2013. Maybe we should watch for Nathan too. My friend & I met Thompson Square @ The Pabst Theatre Milwaukee ,WI. It is a small venue & we were in the 4th row. It was a amazing concert. I will definitely see them again. They were both very sweet & happy to meet their fans. I'm the one next to Shawna. NAC:We really like Thompson Square to Linda. Congratulations Shawna and Keifer on winning their first CMA award for Vocal Duo of the Year at the 46th annual CMA awards. We really were enjoying ourselves walking around Music Row and Studio B in Nashville on Sun. evening, 9/23rd. Wondering if these painted guitars were painted using a reflective paint as it was not quite dark outdoors and the colors just popped!!! In this pic, it is just me and Elvis... hangin' out enjoying the vibes in the air. NAC: We love the photo Mar, Thanks for sharing with us. Your right those dark outdoor colors POP! 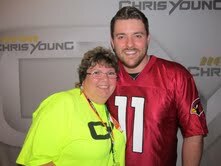 This is Chris Young and me from the three times I met him! The bottom left is from the Maryland State Fair on 9/2/11, the one on the right is from Foxboro, MA on 11/3/11, and the top left is from Camden, NJ on 6/2/12! I'm such a big fan of his! NAC: Well we have to admit Kati, so are we! My daughters with Chris Young, at Six Flags Over Texas in Arlington Texas last summer. It was my youngest daughters sixth birthday and all she wanted was to see Chris and for him to sing Voices, and he did just for her, as he told her he would at their meet and greet. He is an amazing artist and so sweet and humble to all his fans. #liquidneontour with Morgan E. and Maddy H. Thanks for making the girls end of summer 2012 so memorable. NAC: We agree, with you Pam, humble, sweet, nice, and mega talented. Our Sr.Editor predicted over a decade ago, Chris would be a superstar! "I said it after the first time I ever heard him sing and I'll say it again, The name is easy to remember and the voice is impossible to forget." Penny says, "I finally found a picture of Wade and I. It's been a long time since I've had the pleasure in seeing him. This photo was taken when I was lucky enough to be on a "Country Cruise", on the Carnival Cruise Line, with entertainment provided by Wade, Trent Willmon, Jon Randall, Shelly Fairchild, and Jeff Bates. It was an amazing trip. I had a great time. NAC: We first met Penny at the CMA Music Festival in Nashville several years ago. She is a true fan of Wade's and proud to be one of the original "Wadies", an affectionate name given to his devoted fans. In July Florida-Georgia Line made a stop in Waterloo, IA. This was my first time seeing Tyler & Brian, but had been loving their new single, 'Cruise' so when I found out that the concert was FREE, I couldn't resist making the hour trip to see the guys. I was blown away with the amount of energy that EVERY band member has when performing the songs! The best part of the concert was being able to meet the guys afterwards. Definitely a night to remember!!! NAC: We haven't heard of these guys, but thanks for bringing them to our attention. We are defiantely going to check them out! This was taken at Cotton Eyed Joe in Knoxville TN June 28, 2012. I have been supporting Chris and his music since Nashville Star. My first meet and greet with him was in Feb 2007 and I have seen him numerous times since then. He is not only a wonderful singer but he is an amazing person. He loves his fans and consistently lets us know that. I am very proud of him and all he has achieved and I am proud to be a member of his Young Country family. NAC: Like we told Lori from North Carolina, some of our senior staff members have been singing his praises for more than a decade. He is a very talented young man. We predicted he would be a big star. Hi my name is Kate Simmons , I am from Camden, Delaware. I sending this picture to y'all for the fan photo of the week. I am not only a huge fan of Chuck Wicks. I'am also a very, very proud DE street teamer. I became apart of this amazing crew on June 21st. When he came to Dewey Beach for a show at the Bottle And Cork. The whole crew treated me like I was a part of their family and they are the nicest, sweetest people I have ever met. I can't say enough about them all. I never thought in a million years I would get to do something this amazing with such amazing people and for an amazing and very talented singer. There is not a day that goes by where I don't listen to Chuck Wicks cause, " yes I love me some Chuck Wicks:)"
NAC: Thanks Kate, and we are sure Chuck appreciates your dedication, Go Delware! 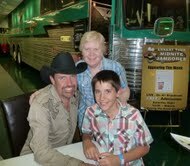 This is a photo of me with both Billy Yates and his son, Grayson, after Billy's International Fan gathering event in June at CMA Music Fest week! What a couple of good 'men'... and singers! Wow! They and their friends came together on the Texas Troubadour Theater stage for us and it was the best controlled situation I've ever experienced in the way of concerts. Besides meeting and greeting two of the Grand Ole Opry members during the break (Bill Anderson and Jim Ed Brown), most of the singers stayed afterwards and met and greeted the fans and signed many special-to-the fans items also. It was a late night but so worth every minute. I highly recommend this event during Fest week. NAC: Thanks Mar, for sharing your story and photo, maybe we will see you and Billy there next year. Just remind him to bring "MFC (Mama's Fried Chicken)". Glenda S. of Indiana says "I am a huge LoCash Cowboys fan!" "Preston Brust and Chris Lucas are amazingly talented entertainers, who's BUCK WILD, ROCKIN' shows will have you becoming the next HUGE LOCASH COWBOYS FAN!!" NAC: Hey Glenda, we understand completely. Whats-her-name, that works with us, she goes a bit "buck wild" at just the mention of these two. I would like to submit the attached picture for your gallery. It is of myself and my favorite singer, Chris Young. 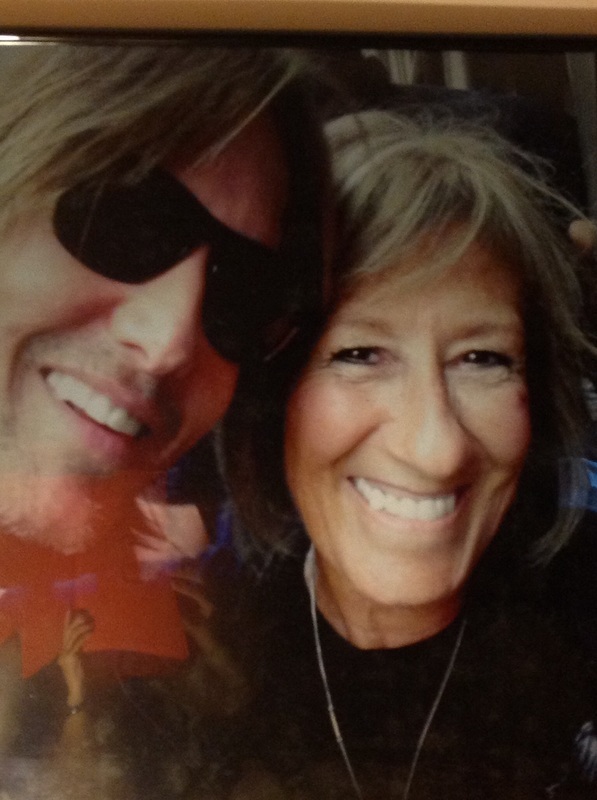 The photo was taken at Toby Keith's I love this Bar and Grill in Mesa, Az, when Chris played there last October (10/5/11). It was my first M&G with Chris, and he was so sweet and welcoming. I was so nervous before hand, and everyone in line who had met him told me "Don't be nervous, he's so sweet", and he truly was. If I hadn't already been a fan, meeting him sure would have done it, what a wonderful person. He was so humble, and what a down to earth nice guy. I thanked him for taking the time to do the M&G's and for being so good to his fans, and he said "No, thank you. I wouldn't be here if it weren't for you guys." Almost as if he knew how many phone batteries I killed voting for him on Nashville Star. The show by the way was amazing! I'm 50 years young, and I'll be supporting Chris for the rest of my days! Thank You! ​NAC: We agree, we agree, we agree. Humble, down to earth, nice, and mega talented. 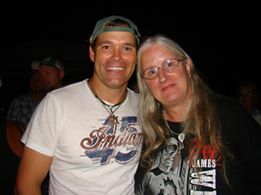 Me and Chris at Coyote Joes in Charlotte, N.C. on June 29th,2012. Chris is my hero, I really do enjoy his concerts and music. He is one of the nicest guy i have ever met. NAC: We couldn't agree with you more, Loria. Some of our senior staff members have been singing his praises for more than a decade. He is a very talented young man. We are pleased as punch that we were right when we predicted he would be a big star. This meet and greet pic was taken with Joe Nichols after his wonderful fan club gathering at the Ford Theater in the Country Music Hall of Fame, Nashville, TN. Joe answered questions and serenaded his fan club members for a few hours on Fri. June 8th, 2012. He honored my song request which turns out to be his own favorite song of his and he also dedicates it now to his baby daughter, Dylan River born in April. It is: "That Would Be Her". Look it up and give it a listen if you are not familiar with that gem. He served steamed hot dogs, chips and drinks before it started... and then fantastic cupcakes were served as the meet and greet photos were started. It was a great time with 'our' Joe! Click on photo for album review. NAC: Toby Keith's video inspired this warehouse shot of Marlene Bencze, who works for Costco in Wenatchee, WA. 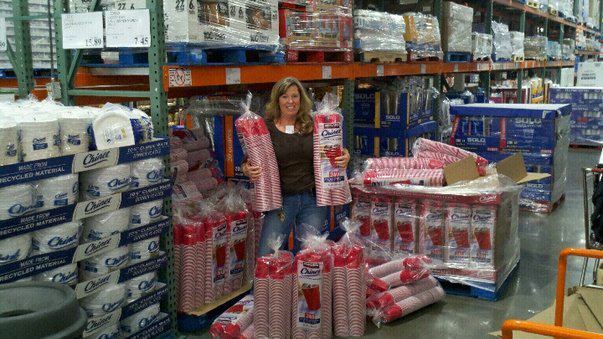 She has the photo up on her Facebook page with the caption, "Red solo cup / I fill you up / let's have a party". In case you haven't seen the video, once this tune gets in your head, it tends to stay there. However, the video is a hoot!